In a new study scientists found a way to make laser light incredibly "pure" by ensuring that it remains steadily at almost the same wavelength. (Note: the image is not the laser in question). 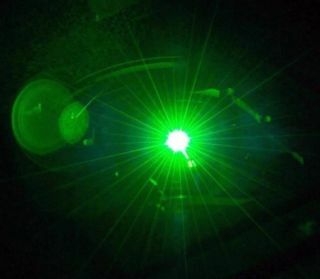 The device, built to be portable enough for use in space, produces a beam of laser light that changes less over time than any other laser ever created. Under normal circumstances, temperature changes and other environmental factors cause laser beams to wiggle between wavelengths. Researchers call that wiggle "linewidth" and measure it in hertz, or cycles per second. Other high-end lasers typically achieve linewidths between 1,000 and 10,000 hertz. This laser has a linewidth of just 20 hertz. This is a big deal, the researchers said, because high linewidth is one of the sources of error in precision devices that rely on beams of laser light. An atomic clock or a gravitational-wave detector with a high-linewidth laser can't produce as good a signal as a low-linewidth version, muddling the data the device produces. In a paper published today (Jan. 31) in the journal Optica, the researchers wrote that their laser device is already "compact" and "portable." But they're trying to miniaturize it further, they said in a statement.